If you please, a few notes about trail etiquette - GetGoing NC! Do not smoke cigars. Midway along the Company Mill Trail, a member of our party stuck her nose in the air and said, “Is that cigar smoke?” Surely not, I said. It was more likely the rotting carcass of a woodland creature who had met its demise. Yet 10 minutes up the trail, off to the side, sat a 20s-ish fellow with a stogie. True, most trailhead kiosks don’t specifically address cigar smoking — perhaps because common sense would dictate that the trail is not a suitable venue for cigars. Just don’t. No portable speakers. A short while later, on the bike & bridle trail, there arose a tinny, scratchy, cacophony of quiet-shattering chaos, emanating from a portable speaker on the water bottle belt of a young runner. If you must listen to adrenalin-pumping music rather than soothing woodland noises, wear earbuds. Downhill yields to uphill. And it doesn’t matter if you’re running. It really doesn’t, middle-age-guy-in-compression-socks-and-knee-length-gym-shorts, who dominated the trail as he barreled down a crowded stretch of Company Mill. Horses. OK, yeah, one exception to downhill yields to uphill: Horses have the right of way on a trail. Keep in mind that the sudden sight of you can spook a horse, so when you’re aware of a horse approaching, step to the side, stop and wait for the horse to pass. If the urge to pet is strong, first ask the rider if it’s OK.
Long time, no talk. A favorite pastime among hikers seems to be catching up on the phone with friends. Might we suggest: Invite that friend to hike with you so you can chat face-to-face. If the friend lives far away, perhaps you could catch up over a cup of tea, at home, rather than on the trail where you tend to be oblivious to those sharing the trail with you. “On your left”. I was last in our group of eight when I heard footsteps rapidly approach from behind. I waited for an acknowledgement — a request to pass or at the very least, a throat clearing — as the footsteps neared. None came, so I stepped off the trail to my right; a young woman passed, not breaking stride, not acknowledging my action. When she caught up to the next hiker in our group, she simply stopped and walked tight on her heels. Our hiker, sensing someone, turned, stepped aside and said, “You’re welcome to pass.” The runner did, with barely a grunt of thanks. People: it’s not impolite to pass a slower party on the trail; just announce your intentions, ideally with a brief and robust, “On your left,” issued 15 to 20 feet before the passing zone. Thanks! Oh yes, and when someone does yield, please do acknowledge their gesture with a “Thanks!”, a cheerful one, if you can manage. Stop to the side of the trail. If you stop to take a drink, check the map, or eat some gorp, step off the trail. Be aware of your surroundings. Good trail etiquette comes down to being aware of your surroundings and remembering that the quiet, the fresh air and the freedom that the trail offers you is why others are here as well. Remember, you aren’t alone on the trail. You hit the trail to disconnect, to escape, but don’t disconnect to the point you’re oblivious to those around you. Of course, we know that YOU always exhibit good trail etiquette. So feel free to forward this Top Ten list to someone you know who might need it. Saturday, Dec. 1, 1 p.m. Umstead State Park, Raleigh. More info here. 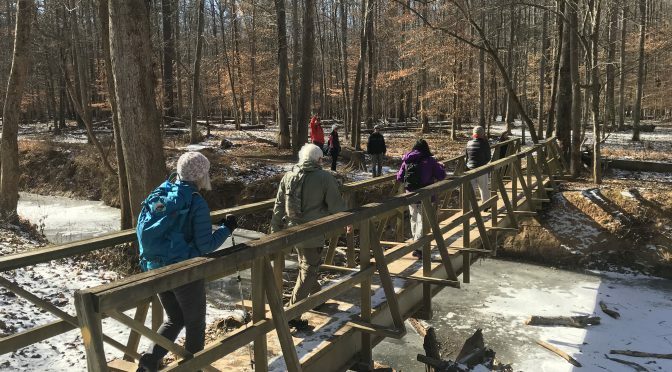 Sunday, Dec. 2, 1 p.m. Haw River State Park: Iron Ore Belt Access. More info here. Saturday, Dec. 15, 8 a.m., Weetock Trail, Croatan National Forest (advanced class). More info here. Thursday, Dec. 27, 1 p.m., Umstead State Park, Raleigh. More info here. Friday, Dec. 28, 1 p.m., Haw River State Park, Greensboro. More info here. For more information on not getting lost in forest, check out this post from March.